Day 365!!! Last day of the print-every-day-for-a-year project! I think the first thing that needs saying here is that a year is a very long time. There are a lot of days in a year. After about 60 or 70 days I remember thinking that we were probably halfway through this year-long blog thing and then being shocked at just how many days there are in a year. Damn. 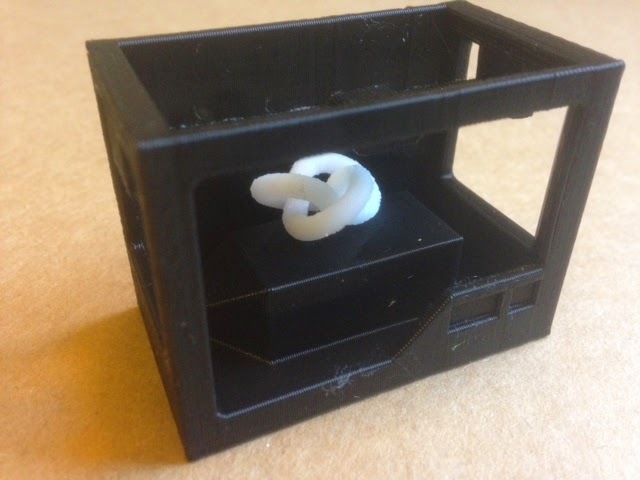 Settings: We printed this tiny MakerBot Replicator 2 on a MakerBot Replicator 2! Layer height .3mm, yes raft, no supports, in 47 minutes. The tiny knot was printed on our other good 3D-printing friend the Afinia H-Series, using .2mm layer height, raft, and supports. Technical notes, ending flavor: After this post we will definitely be taking a break from the blog for a little while. Next week I start my new job as Mathematician-in-Residence at MoMath, the National Museum of Mathematics, and I imagine that I'll be snowed under with crazy projects pretty quickly. But we still have some guest posts coming up, and more things to learn about, design, and print, so the blog will continue, just more slowly. In the next few weeks we'll also build more content at our MakerGeek Etsy shop and our Geekhaus Shapeways shop, for those who want cool 3D-printed stuff but don't have a 3D-printer of their own. THANK YOU to MakerBot, for making the excellent Replicator 2 printer. THANK YOU to Afinia, for making the wonderful H-Series printer. THANK YOU to Shapeways, for printing all the things that I couldn't! THANK YOU to Tinkercad, for being free and easy for educators and students. THANK YOU to OpenSCAD, for making parametric 3D-design free and accessible to all.